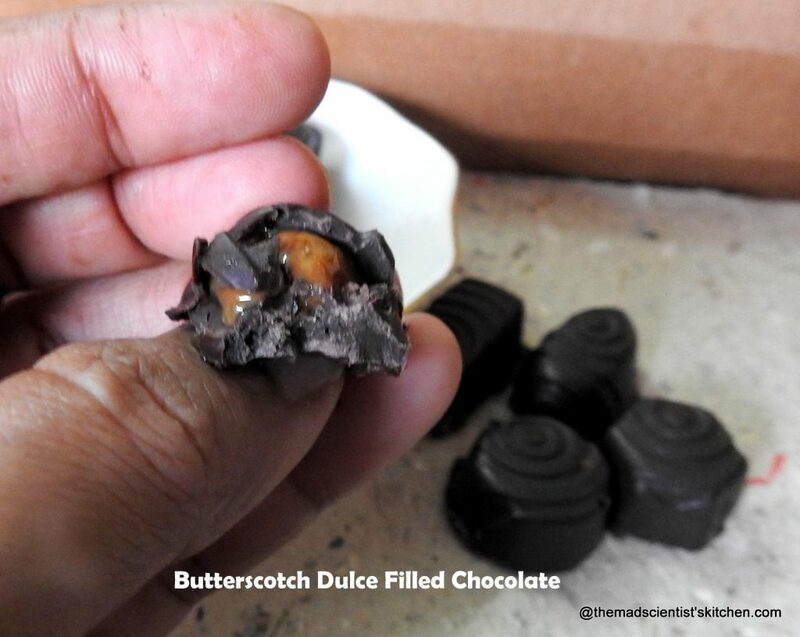 Celebrate Easter with these Yummy Butterscotch Dulce Filled Chocolate! Even if I do not make chocolates the Easter Bunny does end up in my house and we have loads of chocolates to choose from. This time around I wanted to make Easter eggs. The trouble with me is I plan and plan and plan. Like they say all play and no work its all plans and no execution!! So the eggs are back on the drawing board! But let me share chocolate with you. 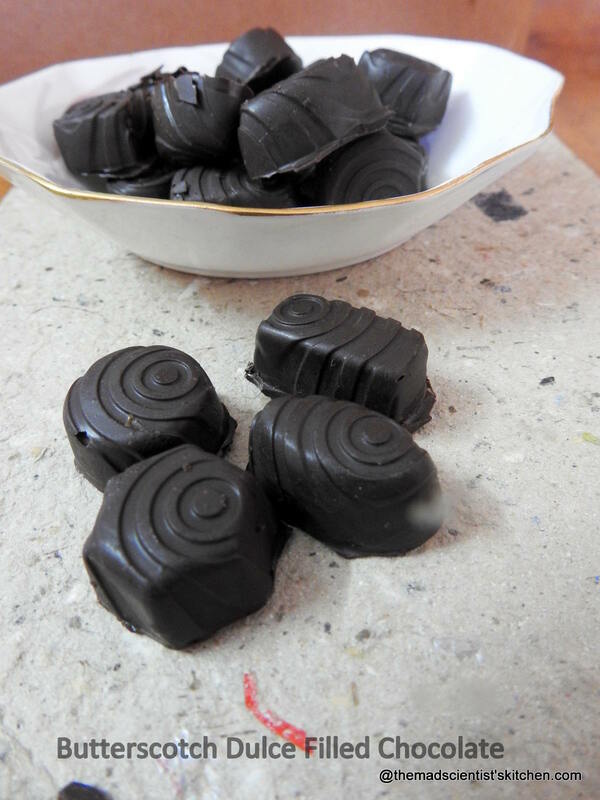 I have been making Moulded Chocolates and Cornflakes , Chocolate Truffles in the past never had I tried filling them. I mean I did not think I could do it/will do it. Then I attended Sandhya’s classes and the rest is history. The recipe its Sandhya’s but, well, you know me I have the piece of paper that magically disappears once I start doing some cooking! The similar thing happened here. These measures are just indicative please adjust to your taste. I am sure the paper will turn up once I hit publish. The water should just touch the bottom of the chocolate bowl. The water should not splash in the chocolate; even a drop is bad for the chocolate. Stir occasionally until the chocolate fully melts. In case you are microwaving it then 30 seconds and stir with a dry spatula. Return to microwave till melted. Now it’s essential to temper your chocolate. When hot chocolate cools without temperature control it results in bad crystallisation. Then technically your chocolate has bloomed. The chocolate does not shine and is covered with white patches. There is no pleasant snap to the chocolate it will crumble. o avoid this temper the chocolate. There are many ways of tempering chocolate the easiest is melting all the chocolate then stirring all the chocolate till it becomes warm. Let’s begin making today’s chocolate I am getting might hungry with all this chocolate talk. Melt and temper the chocolate as I have mentioned above. (about 20 minutes). When the chocolate warm add the amul butter and stir well. This will give the chocolate and extra shine. 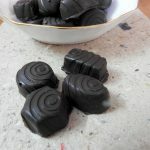 Fill your chocolate mould with the prepared chocolate. Turn the mould on a butter paper or the bowl. Cool in the fridge about 10 minutes. Repeat 2-3 times this will give a thick side to the chocolate. Refrigerate after every addition. Now fill the butterscotch and dulce in the moulds. Take care not to fill to the brim. Add the melted chocolate on the filling and scrape off the excess. This will give the chocolate a clean finish. Place the mould in the fridge to set for another 1/2 an hour. Unmould and warp if they are left after the attack. I love these Archana, my kids get so excited just looking at these! My little one will live on those chocolates! 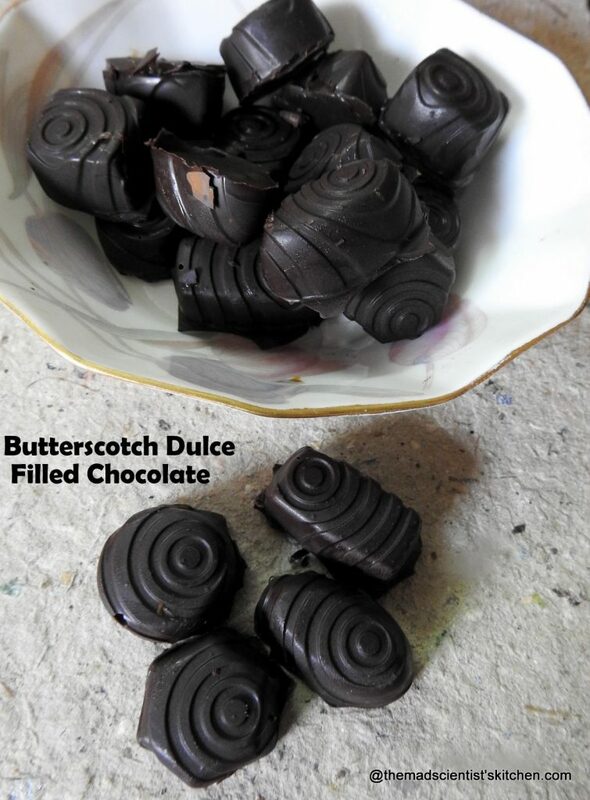 Perfectly made chocolates Archana. They look great. Want to gobble them right away! !